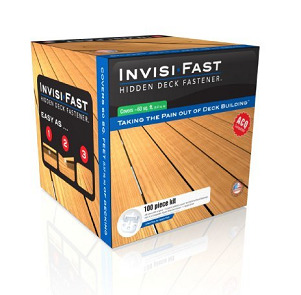 PRODUCT: Invisi-Fast IF-A100-000, 100 piece Invisi-Fast NO SPACEBAR Invisible Deck Fastener Kit with ACQ grade screws. The 100 piece kit has 100 NO SPACEBAR fasteners and 300 each 1-1/8 inch ACQ compatible screws. Price/Kit. The 100 piece kits has 100 NO SPACEBAR fasteners and 300 1-1/8" ACQ compatible screws.